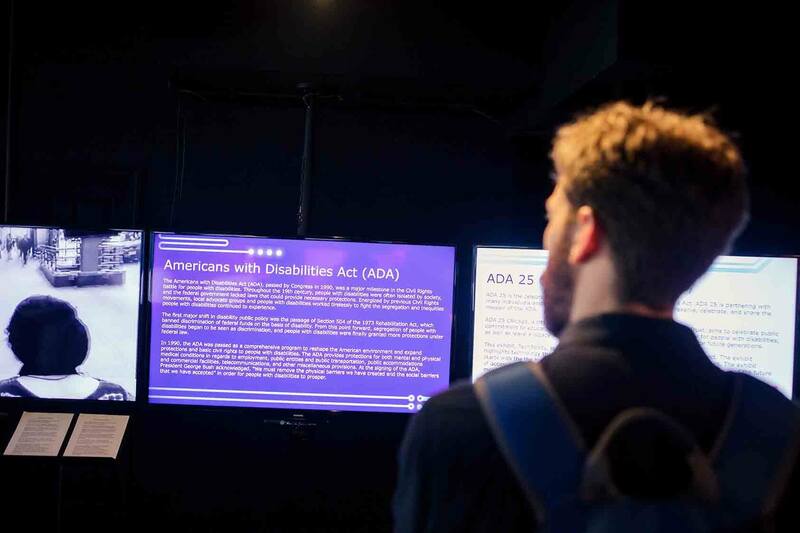 The National Museum of Health and Medicine Chicago recently partnered with ADA 25 Chicago in recognition of the 25th anniversary of the Americans with Disabilities Act to create an exhibit formerly unfamiliar in the community. Aptly titled, "TechAbility; Revealing Possibility," the museumfeatures a horseshoe of TV screens mounted on the walls, extending from one side around to the other. Unlike a typical museum, nowhere will you find artifacts behind glass cases. Instead, the information and images are all presented digitally, offering written information, video interviews, companies involved in technological advancements, and even a station equipped with an Xbox Kinect sensor to involve the viewer in the world presented on-screen. This all comes as a vision of the NMHMChicago to create "a space that is playful, fluid, sculptural (and) dynamic,"whichallows for an ever-changing museum experience. This video explains the vision of the newly acquired building. "TechAbility" looked at the history of mobility, advances from diverse companies, and the foreseen future of accessibility. Visitors could immerse themselves in 3D printing, mobile apps, robotics, transportation, and universal design. BraunAbility even received a space, sitting right near the window where passersby could view it. Our screen showed a brief history of Ralph Braun and the company he created from the small garage in his backyard, which ultimately became the global leader in assessable vehicles that it is today. A van equipped with a wheelchair lift was shown with "hotspots" that, when pushed with a finger, would explain different features of the vehicle. What an honor we felt to beincluded in NMHMChicago's vision of future technological advancements for the disability community! The museum exhibit spaceis really designed with everyone in mind, allowing open space for wheelchairs, low-hanging headphones for the disabled and for children, and with "TechAbility," an immersion into the world of disability, perfect for families or classrooms. Lauren Kalinoski, NMHMChicago exhibits manager, said, "We were honored to collaborate with many individuals and organizations to showcase a variety of technologies to the public. We hope that our exhibit raises awareness of the many Chicago organizations working toward making our society more accessible for all." The museum even boasts a Chicago first: introducing a Beam Smart Telepresence System from Suitable Technologies. The BeamPro is used in conjunction with the "TechAbility" exhibit and allows its user to "beam" into participating organizations to experience them firsthand, sort of like a mechanical assistant utilizing Skype-like technology. This will grant access to patrons who wish to visit the museum remotely through the month of October. It also allowed Henry and Jane Evans of Robots for Humanity to view the exhibit from their home. Henry suffered a stroke, which rendered him speechless and quadriplegic. Through technology like the Beam, he and others can enjoy the exhibit, as well. This comes through participation in the Suitable Technologies Museum Partnership Program, though Heather Robbins, NMHMChicago's head of communications and community partnerships, said the museum hopes to acquire one in the future to house permanently. Robbinssaid she couldn't be happier about the opening reception to the exhibit. 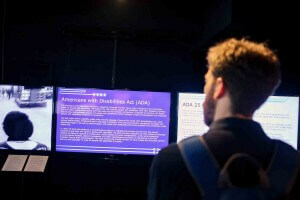 "While the exhibit and film, I think, are pretty freaking cool from a science and technology standpoint, it was really the overwhelming response from different communities and their willingness to challenge normative beliefs about disability that made the event really meaningful," she said. "That was beautiful. That's how positive social change happens." The museum requests that visitors have their affiliated ID or business card to sign in. Other interested parties may request an appointment by calling 312-854-8324. The exhibit space, first floor event space, and adjacent restroom are wheelchair accessible. This exhibit contains captions, audio, and large-print text versions. Special accommodations may be made with prior notice, and groups wanting to see the exhibit again may contact the museum to schedule a viewing.